Lisa Laser is the pseudonym of Zurich lass Lisa Leudolph, who’s made a name for herself as an accomplished artist in various fields, from animation, video, film, visuals and photography to illustration. Already for her BA in design at Lucerne School of Art and Design in 2013, she focused on 2D-animation. Together with her partner Moritz Flachsmann she founded Packungsbeilage VJ Kollektiv four years ago. 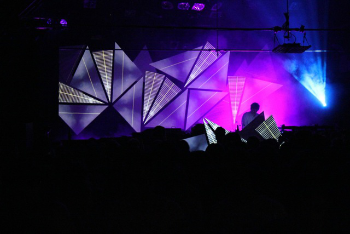 Ever since, the couple have been supplying events, live performances and installations at home and abroad with visuals. And as board members of the Videokultur association they’ve made sure that, having emerged from its niche existence, this part of the Swiss contemporary art scene finds the recognition it deserves.